First of all, I would like to thank the organizers of JSPS A3 Foresight Program for giving me a chance to join the international meeting in Jeju. It was a very exciting and meaningful experience for me. 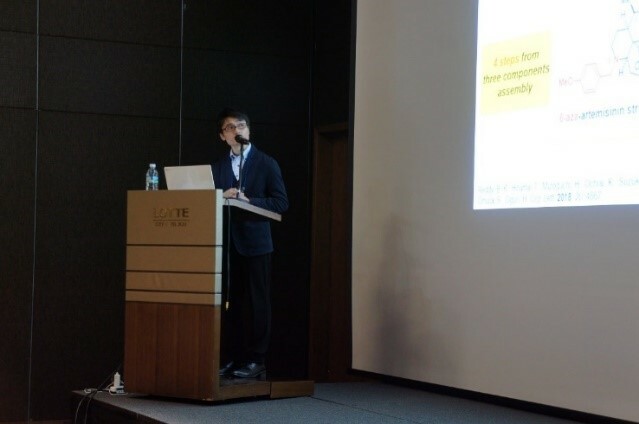 Before the meeting, I made an oral presentation in the A3 young scientist meeting at Tohoku University in Sendai. Fortunately, I got a chance to participate in the A3 meeting in Jeju. Since I had never been abroad before, it was my first experience to go overseas to take part in the international meeting. In this A3 meeting, young scientists were given the opportunity to make short oral (3 min) and poster presentations. I presented recent progress on “Design and Modular De Novo Synthesis of 6-Aza-artemisinins”. Artemisinin, found in Chinese traditional medicine, and its synthetic derivative exhibit anti-malarial activities. Our research group designed 6-aza-artemisinins to develop a modular concise synthetic process of the natural product analogs and chemical probes. Based on the preliminary structure-activity relationship studies, I have recently synthesized a chemical probe bearing an alkyne tag with comparable activity to artemisinin. As a graduate student, it was really a stimulating experience to discuss with Asian professors in face to face. In this international meeting, I learned a series of lectures, which inspired several ideas for target identification with chemical probes. Accordingly, I am more eager to try the experiments of target ID with my probe molecule. I came to realize that young scientist should not only accumulate good and unique research results but also refine skills to make a clear and impressive presentation. I found it was difficult to explain my studies clearly in English, and also important to use simpler expressions. Nonetheless, I was able to communicate with many Asian young scientists, which motivated me to work harder. It was my great pleasure to share the time with them. Through the meetings in Sendai and Jeju, I gained a lot of valuable experiences to become a young scientist. Finally, I am deeply grateful to the organizers (Prof. Seung Bum Park, Prof. Minoru Ueda and Prof. Jianhua Qi) for this precious opportunity.